I wonder if "leaving someone behind" would be a huge problem in Earth Space. The thicker the habitation and facilities up there, the more likely it will be that you'll have Search-and-Rescue Space Forces with all kinds of ships for quickly getting down to a particular orbit to grab someone with a malfunction. That in turn makes it easier to launch spacecraft, since you can tolerate a lower level of reliability as long as it doesn't escalate to "kill everyone on board" levels of failure. I can imagine that the payload of such a craft might include alot of small drones (wire operated if the setting is truly rocketpunk), with the ability to carry sensors, warheads and manipulator arms depending. Furthermore, the drones may have the ability to carry nets (4 drones to each net), allowing them to snare criminal spacecraft (maneuvering in a way that will foul up the manouvres of the crims by pushing and pulling against the captured spacecraft, stopping them from doing anything stupid like running away, without a potentially lethal laser shot being needed to be put in their engines), sweep up orbital debris in a controlled manner (fulfilling the orbit guard function), and catch space-jumping crewmen/supplies/payloads in any Search And Rescue situation. The drone-net would essentially function as a kind of utilitarian hard-sf tractor beam. The patrol craft might also have a search-light for those SAR situations that feature warm hulks that might contain survivors but which cannot be searched with infrared sensors for survivors due to background heat on them. True that in Earth's orbital space, 'leaving someone behind' is probably not a big risk. Really I came up with it in the context of the limits of AI: There are decisions, including some of the most important, for which cognitive capabilities in themselves are not sufficient, at least from our human perspective. I'm sure I'll be getting back to this in a future post! Though - preview hint - I'm thinking that our whole concept of AI, shaped by traditional SF robots, is probably way off. They are mental force multiplying tools, the way a bulldozer is a force multiplier version of a shovel. There could be one big hitch with using aerobraking for inclination changes (which may be why a quick look at Hop's blog turned up nada on it). Lift-drag ratios in the hypersonic regime are - I believe - pretty limited, to the point where the burn needed to regain orbit speed might be as much as needed for a straight inclination-change burn. Lenticular configuration. As aerobraking craft get larger, the square-cube rule means that they must be shallower along the axis normal to the heat shield to avoid excess cross-sectional loading. For the 'cone-shaped' configuration, the cone gets broader and shallower with increasing size, until you get basically a saucer. So this might be the favored shape for large aerobraking ships, say in the 1000 ton class. An interesting question lurks: How big can an aerobraking or flying vehicle get, before structural or other issues make it impractical? I love the net! A nifty workaround for the failure of physics to provide a convenient tractor beam. The initial application might be to deal with crippled, tumbling spacecraft. Specialists might adopt as symbol the reticularius, the Roman gladiator who fought with a net and trident. And yes, a good old searchlight would surely not be amiss. NASA, no later than Apollo, figured velocity vectors in tenths of a foot per second. (Using integer math -- all Apollo Guidance Computer data values and algorithms had implied decimal point positions, based on the type of data being worked on. Floating point math was just too much for such a small computer at the time.) I think they must have gone metric by now. In any case, meters per second is actually a gross approximation in real-world orbital mechanics terms. I think the Patrol would use that scale to discuss the relative magnitude of burns colloquially, but think in hundredths of meters per second for actual application. I would think that once you had a Patrol ship in orbit, there's absolutely no reason to ever bring it back again. Use the mass Rick budgeted for aero-braking and recovery to increase payload and/or delta-v. Or, in an even smarter approach, don't be so rigid about payload or delta-v, but have optional modules available that carry more payload or delta-v, depending on the mission parameters. 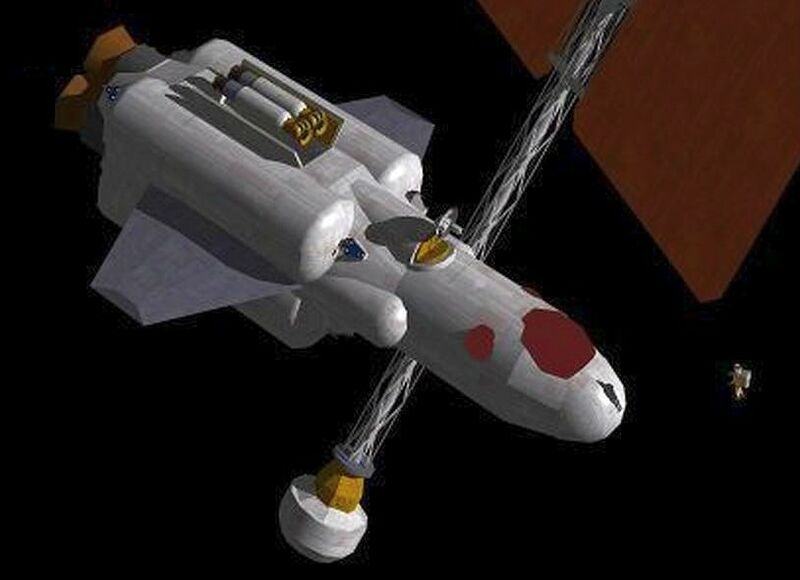 I agree that a baseline ship could be put into orbit using itself for its own launch vehicle second stage, arriving on-orbit essentially dry and with no payload to speak of, but in the proper plane to rendezvous with Patrol refueling and mission outfitting assets. Also, from personal experience, plane changes are always painfully expensive. In the Kerbol system, I believe most people take advantage of it being smaller and just bring along a lot of extra fuel. In RSS, just getting into space is more difficult. I can see the resemblance between the orbital patrol ship and the top of the deep-space ship. Assuming the background of your orbital patrol ship is the rest of the propulsion bus of the deep-space ship on the right I can also see a family resemblance to the spacecraft on the left. What are all the spacecraft in your header image? I remember reading bits and pieces about them from early posts and comments in your blog. The one on the left is the Clarke double sphere inspired design. The one in the far right corner is based on a ramjet shuttle. The middle and right ones appear to have parts inspired by Heinlein style rockets. I have always been curious about the spacecraft in the header image. It would be interesting to have details about each design. For example, is the middle rocket a belly lander or a tail lander? Are the right and left spacecraft related, but with different propellent tanks and payload? Your Patrol might have three main bases in orbit; two in Earth orbit and one in Lunar orbit. All three would be 'home' for one or two multi-purpose rockets(or a bunch of modules that can be quickly mixed and matched). For missions beyond Earth/Luna space, you might want a more specialized spacecraft, or use your multi-purpose ship mated to a booster craft; this could be as simple as a boom with a varying number of propellent tanks and an engine or two (boost and cruise). Once the thing got to its destination, the patrol ship would undock, perform the primay mission. The unmanned booster craft would either proceed to a refueling depot, or swing around a celestrial body, and either way pick up the patrol ship to head back to home base. The Guard (or civilian operators, for that matter) will probably want to have space cutters that are optimized for the particular jobs. Cutters which are operating deep in LEO and need to do plane change manoeuvres will be aerodynamic, and resemble (depending on the size) the cone shaped "Space cruiser" design from the 1980's (essentially an ICBM RV body cored out to carry a single astronaut) to wedge shaped lifting bodies (anything from the Dyna Soar to the XCORPs Lynx to the Russian MiG 105 "Spiral") to actual "shuttle" like vehicles. Aerodynamics are so critical for aerobraking and using aerodynamics for plane change that anything resembling the LEM or "real" space vehicles with solar panels, extended antenna etc. will rapidly disintegrate into flaming balls of burning metal and carbon fibre. For simplicity, a medium sized cone with various important bits like the airlock and manipulator arm stowed and shielded in the rear part of the ship will probably do, having a good compromise between simplicity, internal volume (a bit cramped, but still...) and aerodynamic performance where it counts. For cutters operating higher up, and with no expectation that they will enter the atmosphere, your imagination can go wild. LEM's without landing legs, B5 "Starfuries", random assemblages of tanks and girders; all that is really needed is the ability to get from point a to point b and do the job. The "Starfury" might actually be a good conceptual model, replace the "wings" with assemblies to hold solar panels and radiators, put some thrusters on the ends for good 3 axis manoeuvrability and a honking chemical engine in the back for orbital change and we are good to go. Cis Lunar cutters have the problem of radiation protection, so will be much larger and more massive than their LEO counterparts. Given the longer mission times expected, a Cis Lunar cutter will also devote more space to accommodations, maybe a small galley and sleeping spaces for the off duty crew. I will make one big assumption: the Cis Lunar cutter will NOT be able to take off and land on the moon, it will either carry a LEM like "lighter" or the Moon base will provide that service. Much like the reasoning which led to the Apollo mission adopting a LEM to reduce the overall mass of both the Apollo mission itself and the hardware needed to get to the surface of the Moon and back, having a big cutter capable of landing on the Moon simply adds much more mass and complexity to the vehicle, a lot of which will simply be dead weight for much of the vehicle's lifespan. We will probably have to go for a few generations of operations and design before a practical fusion engine can be developed, which can deliver enough energy and deltaV to render many of the earlier design features moot. A design with a hab in the front, engine/power/tankage in back, and a boom in the middle to carry various mission equipment would be a great place to carry a lander/lighter, work pods, or whatever. On a related subject, an orbital customs 'cutter' would need a gunship to stand over-watch on it as it docked with and boarded craft. The customs cutter and the gunship might be the same type of craft, just with different load outs (troop/docking module vs a weapons module). I do think that the main difference between cutters might be the crew endurance and delta V. A three man crew/week endurance, a six man crew/month endurance, a 12 man crew/ six month endurance, and an 18 man crew/year endurance might be a good basic division of capabilities, to begin with. How much of a wild card would this technology be if it works? Atomic Rockets links to this with more detailed information. This would allow rather non-aerodynamic spacecraft to aerobrake into LEO & only craft intended to go from orbit to earth surface would need streamlining. If the required magnets turn out to be less massive than a heat shield such an MHD braking system might be standard equipment on spacecraft. Interplanetary craft would also use the tech for getting into Mars or Jupiter orbit from interplanetary space. Absolutely. Planning burns will be much more precise. I'm thinking in terms of oral reports of running situations, 'closing rate 5400 meters per second' or the like, where the number would have changed by the time you read off multiple significant figures in any case. Major overhauls, perhaps, beyond what can yet be done in space? Admittedly I ignored this in discussing logistics/commercial craft. Even more admittedly, I was exploring maximum flexibility, and basically the limits of what the tech can do under reasonable overall constraints. Actual Requests for Proposals will be rather more nuanced (and rather less inclined to pick handy round numbers). For non-aerobraking craft this is a no brainer; for aerodynamic vehicles it gets a bit dicier in practice, which is why you don't see a whole lot of modularity in aircraft. But certainly a bay could accommodate a cargo payload (or weapons with their racks/release mechanisms), or added hab capacity, or tankage for some extra propellant. External loads can be carried freely, so long as you ditch them before aerobraking. How do you think I got the 3200 m/s figure for 23 deg? (Rounding, of course, and pending someone pointing out a mistake.) As Daniel says, inclination changes at low orbit are pricey; much more than 23 deg would require well over 3200 m/s, enough to pay for jumping over the Moon with a week's consumables. But obviously in responding to an urgent call you won't want to spend an extra week. In fact, one reason to have some ships equipped for Earth recovery might be so that they can be ground based, available to launch into any orbit as needed. Polar orbits are mainly associated with military spysats, something the Patrol keeps at double arms' length from. But geosats also use high inclination orbits, and at the implied space development level some civilian researchers might be in those orbits, placing them within the Patrol's scope. What are all the spacecraft in your header image? A fun question, that I don't think has been directly asked before! [A small request, though; I ask 'anon' commenters to add a name/handle to their comments, to avoid confusion among multiple anons.] The ships were purely visual designs, not part of a story setting, and not specified in any technical detail. As you guessed, the ship on the left is the Clarkean double sphere, but it also does double duty, with a Heinlein style view dome above the astrogation deck. (I wasn't able to get the neat little ring of side windows around it.) It is meant to represent a commercial deep space ship. The center top ship is (IIRC) a heavy tail lander SSTO - you can see the fairings covering the landing legs, midway between the fins. It does have a side cockpit, probably because it would fly plane-wise in the lower atmosphere before pulling up and pitching back for final powered descent. Maybe not the safest way to get down, but damn it would be impressive to watch! The deep space ship to the right, with the semi-streamlined forward section, is a military craft. It differs in all details from the double-sphere ship, so is not a half-sister, but presumably has a similar electric drive. Note the forward-aiming large antenna and (presumably!) heavy laser cannon. This predates my current conception of laserstars, or I might have specified a bigger mirror. Or you can take it as a mixed-armament craft, not primarily a laserstar. Finally, the ramjet shuttle on the lower right is misleading in one important respect - it is well behind the others, and a lot bigger than it looks, some 100 meters long. I had never heard of Skylon when I modeled it, but it is about the same size and overall configuration, albeit without the BADASS wingtip engines. Taking these comments together, as covering similar ground: In a word, yes. Per remarks above, I was basically seeing how much Cool Stuff a plausible ship could do, which turned out to be an amazing lot. In real life the designers will slice and dice carefully to get the optimum balance for anticipated missions, with allowance for the potential unknowns. And likely at least two types, an aerobraking model primarily for lower orbits and a space-only model, with greater crew endurance, for lunar space and the outer orbital envelope generally. 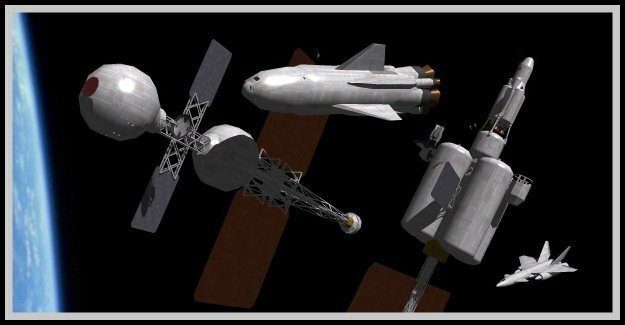 Amazingly for a Hollywood spacecraft, the Starfury might indeed be a good conceptual model if quick pivot performance is important. (As I think it might be, but that is for an upcoming post). Fusion, or other big tech advances, would knock over the whole tea wagon. But for this series I'm being very conservative, to explore the limits of what we basically already know we can do. Seems likely! On crew endurance I think there is a big dividing line somewhere around the two week mark, basically between what you can tolerate for a fairly short mission and what you need to live aboard for an extended time. And maybe another, currently pegged at six months, where you need a spin hab and really robust shielding. Space medicine and psychology experts will refine this - rocket science is a snap compared to human factors! In this early period the ships of the Patrol will likely be limited to two weeks, as distinct from stations/bases. But as the human deep space presence grows the Patrol will naturally default to expanding its scope, in due course procuring its own deep space ships. And in this era the interest (and thus potential pushback) of terrestrial powers will likely be inverse to distance from Earth. At least until/unless some McGuffinite emerges to focus their attention outward. Then of course all bets are off. Maybe. How much of a wild card would [magnetohydronamic aerobraking] technology be if it works? Depending on how it works, what requirements, etc. If beaucoup electrical power is required, it won't much matter for smaller spacecraft, at least until/unless beamed power is readily available. Big electric ships might be able to aerobrake handily down to low orbit - but still have a tedious spiral to get back outward, which could still discourage them from close approach to Earth. In general, some combination of 'alternative' techs - MHD braking, beamed power, tethers, you name it, could eventually sweep the whole rocket era into nostalgia for the days when men and women were hot, and space travel was Cool. Or they could become 'electric railroads' serving main routes while other travel is not much affected. Or never play more than a marginal role. I was recently wondering how Orion would fit there. In this particular future, the answer is probably not at all. Varied powers don't want to alarm each-other by using such... aggressive propulsion method, and similarly the Guard would try to keep lower profile than that. It feels that it could be possible in a slightly different near future (and hell, starting now). While the varied powers still wouldn't want to alarm each other - probably one of the main reasons it was cancelled in the '60 (seriously, who thought putting a 3000 Mt nuke in orbit was a good idea?) - there is now a long tradition of international cooperation in space programs. So a concerted effort to create an international organisation that would develop and use nuke pulse crafts could work. It would explicitly try and keep members from taking it over, so the US/Europe and Russia can work together as a better alternative of either doing nothing or starting a new, unwise mix of space and nuclear race anew. It could be fired from northern Norway: Norway is historically neutral, and the closer from the poles the better with those pulse nukes. It wouldn't be easy (nor probable), as the US and Japan would have to accept that the Chinese are part of it or start their own program. And North Korea may try and start its own as well, though that could be an interesting thing to follow. The problem with nuke pulse drives is taking off. Even assuming that we can get fallout (unburned fissile material) down to negligible quantities, fission products would still make the landing pad and everything around it horribly radioactive for months. Even if there is no-one living in the extended radius, it would make operations way more difficult, and Norway may be unhappy about it. Even worse, giving how people freak out about nuclear powerplants and invent the most insane problems when they are working too safely for their nuclear scare, one can imagine how they would react about a nuclear explosive-driven rocket. How long before Greenpeace activists sabotage a launch? On the other hand, taking off with good old chemical rockets kind of trash half of its advantages, as you have to design pretty monstrous ones to launch it. So what if we used gun-propelled conventional explosives while in atmosphere? While in atmosphere, the yeild of pulse units would have to be way lower, because air would transfer energy more effectively. So pack conventional explosives on the pad, under the plate. That's what replaces your first pulse unit. Then, place guns near the launchpad. As the craft ascents, they fire guided artillery-like projectiles in rapid succession at it, each containing a directional charge. As if flies right below the plate, it detonates in its direction, pushing it. The projectile's trajectory would always be carefully calculated to not pass to close to the craft - if it didn't explode, or exploded too late (like right next to a window). The craft would take off in a carefully planned trajectory so any projectile that miss would end up in the uninhabited Arctic or Pacific ocean. The guns themselves would be fixed, so some joker can't turn them around to bombard Russia or Europe. And the projectiles may be specially made to be easier to intercept, just in case. Once above the atmosphere, the craft would have enough delta-V with its on-board pulse units to go orbital, and take any orbit it wants. So the atmospheric trajectory would gain to be fairly vertical, compared to conventional rockets. Even in atmosphere, the projectiles' yeild would probably be lower than required, so the frequency would be higher (the plate wouldn't be fully pushed back). Depending on the specifics (fragments? ), a protective, disposable shield may be added on the plate. It would be the crude equivalent of a laser- or pebble-launch, with similar advantages: no fuel transported by the ship (meaning better performances), complexity moved to the ground where it's easier to manage, reusable installations. There would be high redundancy: multiple guns, many projectiles - if a projectile fails, the course of others would be modified in real-time to take the trajectory change. The projectiles wouldn't be cheap, but compared to rockets, it would probably still be better. Particularly as they could be mass-produced. What glaring flaw did I miss? Serious creativity points for this approach! The great meta frustration paradox of 'nuke pulse drive' has always been that the one application for which it is uniquely capable - as an SSTO - is the most problematic of all. The suggestion, shown at the Atomic Rockets site, of using a couple dozen Shuttle solid boosters to lob it clear of the atmosphere reeks of desperation. Using gun-fired shells substantially alleviates the problem, but (I suspect) doesn't really make it go away. Reflecting bangs off a pusher plate is an inefficient way to produce thrust. For the drive itself this is not a problem, because if there is one thing it has it is sheer power to spare. But it would take a LOT of feeble little HE shells to push that sucker along - so many, I suspect, that they would still wipe out the advantage of the drive. One thing that wouldn't be so much a problem, I think, would be 'safeing' the guns, because their potential range would not be all that much greater than traditional battleship guns. Not a threat to populated regions from any site acceptable for launching the vehicle anyway. But in any case, the nuke pulse drive is not suitable for routine use in orbital space, because it is a nuke drive that can't possibly be all-around shielded. Routine use would blow through long term radiation limits out to an enormous radius, on order of 100,000 km. I doubt that recycling the name was decided at a political policy level - how many pols could identify the constellation, let alone the space drive proposal? My guess is that it came from someone in NASA who wanted to give the name of noble Orion, as I call him, to a spacecraft that might actually get built. Is nuclear power (as distinct from bombs) really that controversial any more? My guess is that those of us who remember the 1980 era have all too vivid memories of antinuclear marches and such, but I think it has mostly faded as a political hot (so to speak!) button. My own skepticism about the nuke pulse drive (apart from, you know, that whole atomic bomb thing) centers on the pusher plate and those giga monster truck shocks. Would they really stand up to hundreds of close-in nuclear bangs in rapid succession? I guess I should have made my premises clearer. 1. The reason you don't want to recover Patrol ships to Earth is that they have a limited service lifetime, after which you dispose of them. We already know how to make such ships with long enough built-in endurance to not need major repairs during their planned service lives. We're not going to suddenly get stupid about that. Also, if a ship needs a big enough repair to justify grounding it, running through what would amount to a factory rebuild, and launching it into space again, would it be safe to try to land it to begin with? Even if it would, why not just launch a new ship instead? Yeah, it's a little -- maybe even a lot -- more pricey, but it's new, with all of the advantages that usually implies. 2. Because patrol ships stay in space once launched, they need not be so configuration constrained. They need not have mass spent on aerobraking and ground recovery features as well. As already stated, that frees up significant mass for payload or propellant. 3. Because we are not going to be aerobraking these ships, the 3200 m/s to the Moon and back is not a realistic figure. You have to decelerate into Earth orbit once you get back. That's what I meant by doing the math. Or, if you want an aerobraking and Earth-landing ship, then you're not just lifting the payload, consumables, and some structure out to lunar orbit, you're lifting all of that special-purpose mass all the way out to lunar orbit too. And if your mission is out to lunar orbit to do something there to begin with, once again your lifting all of the mass that does you no good out there. That made some kind of sense with Apollo, where the extra mass was limited to a heat shield for a crew return module and some parachutes. But the whole spacecraft? Every time you go out? I get that such a ship is rocketpunky, and that's a big deal to you, but I'm just not seeing the sense in it, even for the sake of Romance. I wasn't really thinking of rebuilding the airframe, the way wooden ships were dismantled and rebuilt. (A process that sometimes became administrative sleight of hand, building a new ship with the old ship's bell and name.) I was thinking more of upgrading onboard systems, replacing worn fittings (gaskets, seat cushions, whateva) that are more economical to replace than build to match vehicle service life, yada yada. Does anyone in this community have first hand knowledge of current aviation practice? The ISS will eventually have to be abandoned and ditched (though they have extended its planned lifetime, and will probably do so again). I assume this is not because the basic structure is wearing out, but because onboard systems are, and there is no way to overhaul them. As cageworks are developed, the scope of maintenance in space will expand until eventually ships are built there, but likely not at the development level I'm considering here. And truth to be told, maintenance was a toss-off thought. I originally specified Earth recovery for operational reasons, if only because 'ground crew' is a whole lot cheaper to support on the ground than in an orbital hab. Why not? Ships built primarily FOR lunar or outer-orbital space, like lunar landers or those operating between lunar orbit and the Langrange points, won't be built to aerobrake. But ships operating between the Moon and LEO surely will aerobrake (unless some devil in the details makes it non-viable), because the 15 percent shielding mass penalty is about the cheapest 3200 m/s of delta v you'll ever get, at least at this techlevel. When I initially modeled the ship in this post, I wasn't even thinking about the Moon. My first specification was enough (powered) delta v - 5700 m/s - to get from LEO to geosynch, then the return transfer orbit, aerobraking back to LEO. (I then goosed delta v up a bit to get a nice round 75 pct propellant fraction, not to mention some operating margin.) But it was only after choosing that performance spec that I realized, hot damn, it is actually easier to get to lunar orbit and back. One of those counterintuitive things! It might work out that geosynch, for all its economic importance, remains almost entirely a domain of satellites, with the rare ship that goes there using drop tanks and kissing them off on return. And patrol ships may be built purely for either low orbit or lunar space, with only standard transport types used to get between them. But for a (zero budget!) technology demonstrator, I wanted to show the full range of what a plausible chemfuel rocket ship can do. No. Seriously. Not. In spite of this blog's name and banner image, the rocketpunk vision has turned out to be fairly incidental to my project here. Most of my discussion of spaceships has been about fairly Realistic[TM] deep space craft, nuclear or solar electric, with milligee acceleration. Clarke turf, yes, but totally alien to Heinlein, who really loved him some bone crushing acceleration. I've never even looked at nuke thermal propulsion - the realio trulio Atomic Rockets - until I played around a bit for this series. I had never even really thought much about orbital space, and the craft it calls for - I did just a bit, at sfconsim-l, just before I launched this blog, hence the semi-streamlined forward section of one of the deep space ships in the banner image. Only when I played around with the numbers here did I find out that classic winged/finned tail landers and such look doable, and might even have a plausible mission. There are good reasons (at multiple levels) why no such ships might be built. But, flip side, I don't think it is fanciful that a quasi-military or emergency service might have some ships that sacrifice payload and operating economy for maximum flexibility. As always, YMMV, but that is presumably why we have these discussions! There may be other work arounds to get the sort of "rocketpunk" performance out of ships. Lookig again at the 1980 era "space cruiser" (it was really nothing of the sort), we see a tiny spacecraft initially conceived to be blasted into orbit from a SLBM tube to make surprise inspections of Soviet space hardware. However, it was realized that the Space cruiser design had lots of advantages, inclusing the ability to make plane change manouevres in the atmosphere, the ability to make pin point landings (via parasail) and small enough to be launched from multiple types of vehicles, including recycled M-X boosters an being carried aloft by the Space Shuttle. The last two opened some interesting avenues, since the larger diameter of tghe launcher and the greater "throw weights" allowed the "Space Cruiser" to be carried with a trans stage that provided more consumables and rocket fuel (and thus greater deltaV). It was suggested that with a big enough trans stage the Space Cruiser could actually reach lunar orbit (although an astronaut sealed in his suit for the trip would probably not appriceiate this). The basic shape of the Space Cruiser (an elongated cone) can be scaled to a certain extent, and the rear of the cone can be extended a bit with a cylendrical portion for crew and some stowage, say the size of an Apollo CM or SpaceX Dragon (the fuel and systems will be in the pointed part in front, in reverse of the Apollo/Dragon practice). An additional trans stage can be boosted into orbit to be docked to the back of the cone shaped cutter, which holds a lot more fuel, extendable solar panels, consumables and maybe even some extra living space. Depending on the mission, the trans stage also houses modular units for special missions (so a crew might have a Pilot, a Mission Specialist and a Payload Specialist). So this Space Guard Cutter can operate in LEO with a two or three man crew, or dock with the trans stage and carry out extended missions, maybe even to the Moon and back, re;leasing the trans stage prior to atmospheric manouevres. If the trans stage can be braked under its own residual rocket power once the cutter has cast off, or use MHD or other techniques to aerobrake, then even better. For a strictly orbit to orbit patrol ship that can do all of the same missions, (except the landings) you could get rid of 30 tons of dry mass, and the dV to match would be 11600m/s for LEO to Mars orbit and return. That would mean a total mass of more than 800 tons. If you set the bar one step lower at LEO to L4/L5 and return, that gives a more reasonable total mass of a little more than 450 tons. The ship could still do a one-way trip to Mars and return if there was a refueling base on one of the moons, but its versatility is reduced just a bit more. If the 20 tons of heat shield and aerodynamics save 50 tons of fuel and increase the ship’s versatility, then they are worth it. I think that the only reason the patrol ship would need to land is if there aren’t well-stocked propellant depots in lunar orbit or L4/L5, or if they were out of the space authority’s control. Propellant depots would mean frequent trips by lighters to and from a lunar ice-mining base, and the space authority could probably afford its own specialized lighters to enforce their authority over the lunar surface. As to bringing it back to earth, even when the cost of another refit exceeds the cost of launching a new ship, the old ship is still 100 tons of space-capable hardware that doesn’t need to be boosted into orbit or constructed on an extraterrestrial base, so it’s definitely more valuable in space than on earth. If it becomes so old that fusion engines and/or magnetohydrodynamic wizardry make it obsolete, then the space authority could probably find a less well-endowed organization to sell it to. Serenity anyone? Of course, landing legs do make it more versatile and a much better plot device, since the intrepid crew don’t need to stop at a station and become passengers on someone else’s spacecraft just to get to where they are trying to go. As for radiation protection, you could store a fraction of the ship’s fuel as water surrounding the crew cabin. It also might reduce fuel tankage mass. No kidding! Unless they were thinking 'cabin cruiser' rather than the naval kind. Even then it would be cramped, waaay too suggestive of a coffin. There's no reason the transstage couldn't have its own heat shield and Earth recovery chute, which only need to handle the empty mass of the transstage. I am overall pretty agnostic about the possible configurations of Patrol craft - ultimately they will all be determined by the actual or projected mission requirements, as these emerge from operations. So long as you are regularly operating into LEO (or low Mars orbit), the heat shield and aerodynamic form are well worth having. Certainly you can delete Earth recovery, and Luna/Mars landing, if these are not in the anticipated missions. And I wouldn't be concerned about round trips to Mars, since the life support is not designed for long duration (and the ships I have outlined are too small for human interplanetary missions). One-way robo ferrying to Mars (or back) is more useful, if the Patrol expands into Mars space, as it likely would if the human presence there becomes substantial and politics does not preclude it. Well, yes. Obsolescent types will be a natural source of (relatively!) cheap spacecraft on the second hand market. That and economic bubbles, which will sometimes throw shiny unused models on the market for pennies on the dollar. Indeed! And more to the point, an emergency craft really doesn't want to rely on other ships being available, because when you need them, Murphy will make sure they aren't available. A fair number of adventure tropes - though certainly not all of them! - have roots in practical considerations. Amusingly enough, the Orbital Patrol ship boosted into orbit on a heavy lift stack reminds me a little bit of Tinsley's design for the Three man space scout. Except, happily, for the M-wings, not an aesthetic triumph. And I never quite figured out why it flew backwards in atmosphere. A nasty thought: a Space Guard Cutter can become an extremely effective warship if it carries a deployable "fighting mirror", allowing the owning nation to project their laser in unexpected places if a crisis occurs. The Cutter can either deploy the mirror and aim it using on board systems (although after the first laser shot is banked off the fighting mirror, the Cutter will become the target of a lot of hostile attention), or dump the package and jet into a new orbit while the mirror deploys (it will most likely be a mylar "balloon" with a small aiming package and set of thrusters for its one use. Think of the solar sail deployed from a breadbox sized "Cubesat" for a conceptual idea). WRT Mars, there is no real reason a Martian colony would not want to create and deploy a Space Guard of their own (on the "national" model of Coast Guards). Like their Earthly counterparts, the Martian Guard observes objects in Martian orbit, checks and enforces standards, and if required, cleans up space debris that threatens orbital installations or rescues people and ships in Martian orbit. There is no real reason the Space Guard would have to be associated with Earth's Space Guard, and indeed the logistics would speak against this. Even Martian Space Cutters would be different from their Earthly counterparts to match the different operational conditions (Martian Cutters would have a much easier time operating since they can dock and deploy from the Martian moons in close orbit around Mars, while the Earthly Space Guard would either have to boost from Earth or use space stations, and have many more constraints because of this. Space Guard Cutter can become an extremely effective warship if it carries a deployable "fighting mirror"
Everything really depends on what the terrestrial powers have up there. Which might be less than we'd intuitively expect, since they are mainly worried about each other, or even midrank regional rivals, and space force budgets compete with other defense priorities. OTOH, I'm portraying a setting with $200 billion plus in orbital assets. So for story purpose you could justify anything from space remaining more or less demilitarized to it being armed to the teeth. On deployable fighting mirrors, they seem to be popular, but I'm not sure how much advantage they confer. They let you zap around corners, which could matter in orbital space. But I don't think they increase zap range, and they require their own control systems, etc. The solar sail analogy doesn't hold up, because a fighting mirror has to have observatory-grade optics to pass along a precision beam. A solar sail just has to bounce sunlight in more or less the right direction. Once there is a Mars colony, indeed not. But an Orbital Patrol might well look at an initial Mars presence once there are on order of a thousand people on/around Mars - presumably long before anything like a colony emerged there. Now, if there is a single unified Mars Project, it might well establish its own rescue/enforcement arm almost from the outset. Such an agency is contrary to rugged-individualism tropes, but would encourage the early development of a proto-Martian identity. The use of fighting mirrors provides some flexibility to laser operations in orbit. It is potentially cheap (your laser hardware is on the ground in a hardened installation), multiple light paths, to confuse eyeball frying strategies (of the constellation of mirrors in orbit, which one is going to be used?) and to increase the area of coverage. The Cubesat analogy was mostly to show a fighting mirror could be in a very small package stowed away in a payload module; a weaponized deployable mirror would be more sophisticated, but might not be in a much bigger package. I'm not sure the Space Guard would be keen to go to Mars, given the time and resource allocation needed. As well, Space Guard Cutters would not really be equipped with the propulsion, life support and radiation protection needed for deep space missions lasting for two years or more. The Commandant of the Space Guard would have some difficulty supporting a request for a Martian expedition (maybe in fine bureaucratic tradition he could try to pawn it off on the Skyguard instead!). It would be interesting to think of a scenario where the Earth's (or a national) Space Guard is deployed to Mars. I don't think the fighting mirrors would be 'cheap' - but certainly a lot cheaper than a complete laserstar. As almost always in these things, it depends. Different internal interest groups will push different ways. The Chief of Operations probably feels overstretched as it is, because operations chiefs always do, while the policy leadership has the natural (for them) impulse to fill a vacuum. A great counterexample to expansion has been the total indifference of the US military to human spaceflight, let alone pushing for a Space Force. But in that case any such force would be entirely different from existing components. No existing Pentagon 'mafia' - fighter jocks, carriers, whoever - could look forward to owning it. But a Mars patrol does the same stuff orbital patrol ships already do, just on a different duty station. And the ship I outlined would be fully capable of operating in Mars space - perhaps tweak up the propellant fraction just a tad to give more margin for Mars surface to Deimos, if that capability is desired. The ship has ample delta v for the Hohmann trip to Mars. The limited-duration life support is totally insufficient, but the ship could be flown there under robot control, the crew(s) going on regular deep space transports. Procuring its own deep space ships would come much later, if the Orbital Patrol gradually morphed into a Solar Patrol. From historical examples, I would suggest that there have been surges of interest in manned space among elements of the US armed forces, but in general technology has pretty much eclipsed any potential advantages of a manned platform in favour of unmanned vehicles. I could point to Project Horizon, where the US Army was considering how to build a manned base on the Moon, or US Air Force projects like RoBo and DynaSoar (manned rocket bombers), or MOL (a manned recon sat), or the US Navy's "Space Cruiser" discussed upthread (shooting an astronaut into space from the missile tube of an SLMB is pretty crazy on the face of it; the only remotely similar idea I could think of is putting armed biplanes aboard an airship in the 1930's. The Navy is nothing if not forward thinking...). Of course a military base on the Moon isn't all that useful for anything (if directed at Earth, Garry Anderson has a few ideas later on with the UFO series), while computer control of the ICBM and RV's ensured highly accurate missions without the use of a human bombardier, and remote sensing by unmanned satellites pretty much all killed the Rocketpunk idea. Even surprising an enemy satellite or space system is much easier with an ASAT or micro satellite, or a drone like the X-37. Perhaps the closest that any service may have gotten is the USMC's SUSTAIN program, to use rockets to send small units of Marines directly into the AO from the United States in a matter of hours and without needing to worry too much about things like airspace clearance and overflight rights. Here at least there is a rational for the manned crew (although the rational involves them rapidly exiting the spaceplane once it reaches the ground), which is missing from all the other ideas in real life. It might even be possible to imagine a Space Guard with robotic vehicles entirely controlled from some sort of "Mission Control" building on Earth. The robotic "cutters" spend most of their time inspecting space vehicles and installations for compliance with various regulations, grab onto and deorbit space garbage which threatens space installations and other mundane operations. If there is some need to perform space rescue, a CRV like vehicle (or a derivative of the X-37) can be quickly shot into orbit and meet up with the vehicle or installation that needs rescuing, maybe with a polite and medic aboard, or maybe under remote control (the Space Station or vehicle crew provides the medic). Hardly romantic, but from an operational perspective robot vehicles in orbit and manned or human capable vehicles in climate controlled hangers on the ground with regular inspection cycles would seem to be a much more "realistic" scenario, sadly. A new front pager is up, Luna Rising. Although you don't say so explicitly, it fits your segue that most of these were early on - basically in the rocketpunk era, before the robotic option emerged. And most were just paper studies; so far as I know, only DynaSoar and MOL got to the metal bending stage. And I have to admit trouble in taking SUSTAIN seriously. For one thing, are Marines really even configured for operations on this scale? Of course I would not want a squad of gyrenes to get in my face, but I think of them as trained and equipped for larger 'conventional' ops, not like Navy SEALs. Of course if the thing were budgeted they could configure for it, but basically this looks like an exercise in envelope pushing, something the Marines are historically good at. Sometimes with notable consequences, e.g. developing amphib ops between the wars, when the rest of the world associated the whole idea with Gallipoli. robot vehicles in orbit and manned or human capable vehicles in climate controlled hangers on the ground with regular inspection cycles would seem to be a much more "realistic" scenario, sadly. Mysterious little typo: maybe with a polite and medic aboard A cop? Just checking! Ha ha: the pilot obviously needs to attend to the welfare of his crew; hence polite! I'll blame fat fingers for that one. Marines are good at pushing the envelope; they also invented dive bombing in the 1920's, what we recognize today as "nation building" during the Banana wars period and more recently "Distributed Operations", which allows units to operate farther apart than ever. SUSTAIN does seem to be more SoF oriented, but then again the Marines consider that they are SoF capable. As a way of substituting "speed" for "mass", the only way to beat that is to "beam" them in a la Star Trek. I had no idea that the Marines came up with dive bombing. And yeah, if you're trading mass for speed, you won't get much faster than insertion from space. Lurked in the background reading this site for a while, thought I'd pipe up for once. Disclaimer that I'm way out of my maths depth on this one, my SF work is built on "seems plausible" rather than "numbers are in the right ballpark". Seems likely to be related to desired payload? Seems likely that you'd want a coaxial weapon - especially for kinetics, and to lower the need for mirrors and the like in lasers. If your weapon payload module is shorter than this 12 metre cone shape limit, no problem. But I suspect that this won't do for any sort of kinetic projectile. Current artillery guns range from 6-10 metres (ground-based, M109 self-propelling howitzers and the like) to 15-20 (large-caliber naval guns), reaching ballistic velocities barely over 500 m/s. This won't do. Upping the barrel length to rifled small arms proportions (because we are, like small arms, relying on kinetic energy and not an HEAT shell to do the work) we're looking at 15 metres at a ballpark (18 inch barrel on a 5.56 weapon = about 80 calibers ish). I think there's more of a following for laser weapons here though! I haven't the slightest clue about laser weapon engineering other than that cooling is going to kill you outright in space, though, so couldn't even start to guess the length of a spaceborne laser weapon. Perhaps the one thing I'm actually qualified to talk about, briefly mentioned above. Our current, industrial- and real-world application of AI may be summarised as only slightly better than the bulldozer-shovel approach. Our AI-bulldozer analogy using conventional programmed AI can deal with several kinds of earth, with a limited understanding that the earth it moves has different qualities that affect how the earth-moving should be carried out. I feel quite confident that future AI developments will expand to include the abstract idea of earth-moving, with a further idea that there are several tools at hand for the job and that any combinations of these tools may be used as long as the required earth-moving result is accomplished. The possibility of "strong" or "human-equivalent" AI is a whole different matter, but I'd bet on the Patrol Ship being constructed long before then.